Man. I thought I was SO cool when I got my Palm Pilot! “Check this out…it’s a stylus”. Went it went color! OMG!! I like…flipped out. It’s amazing to think how quickly times have changed. I’m sure 5 years from now I’ll be thinking…wow remember when we had to use our fingers to input into the iPhone? Time is flying. Hug your children, call your mom and cherish your gadget until the next thing comes around. Animated QR Code using Flash. What will our industrious friends in Japan think of next! 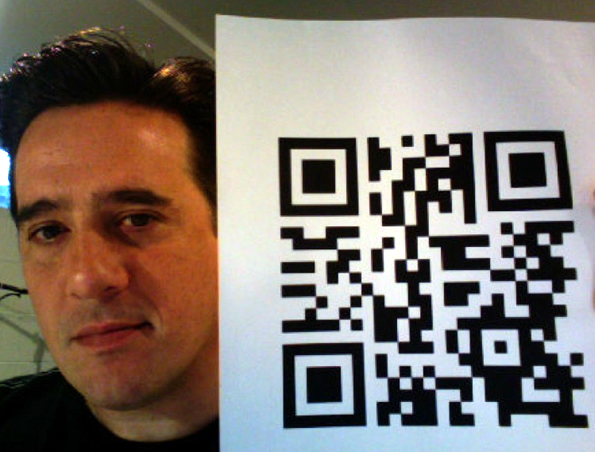 First saw this REALLY creative QR code on 2d-Code site. Really clever use of the technology and opens the mind to new possibilities! Posted on January 6, 2011 June 8, 2017 Author jhondroulisCategories Best Practices, Mobile, QRTags QR CodesLeave a comment on Animated QR Code using Flash. What will our industrious friends in Japan think of next! Help us @mihai, you’re our only hope! #delicious to #GoogleBookmarks broken or blocked? @joshu any ideas? Is it a bug fix? Server crash? Delicious blocking calls so they don’t have all usere bolt before they have a real exit strategy? What ever it is, can you ask your buddy over in the Bookmark world to do something. So if you’re reading this Mihai Parparita, please liberate the deliciousness that is held hostage in a purple tower of gloom. Help us Mihai Paparita, you’re our only hope. Unless of course @joshu has a better idea then you’re off the hook. Posted on December 17, 2010 May 11, 2018 Author jhondroulisCategories Out and About, UncategorizedTags delicious, Google+, yahooLeave a comment on Help us @mihai, you’re our only hope! #delicious to #GoogleBookmarks broken or blocked? @joshu any ideas?